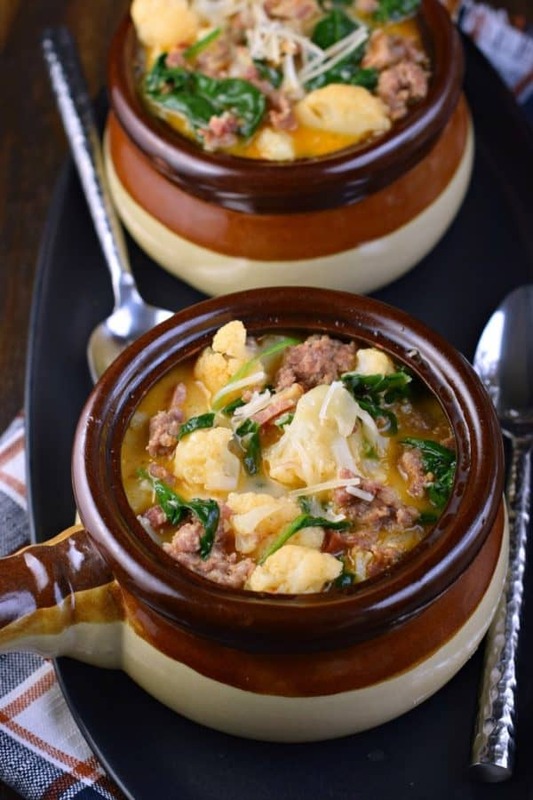 Low Carb Keto Zuppa Toscana Soup recipe is packed with flavor from crispy bacon, Italian Sausage, spinach and tender cauliflower all in a rich, creamy broth. The season of soup is here! It’s time to indulge in all the comfort food. Oh wait, you’re cutting carbs? Trying to follow a keto friendly diet? I feel ya. Doesn’t it seem like all the comfort foods involve carbs somehow? This past month we’ve had a nutrition challenge at our local CrossFit box. And while I wish I could report that I rocked it, I’m here to say, I failed. I didn’t prepare for this challenge as much as I should have, you know, planning some low carb meals! Here’s the thing. Carbs and CrossFit go hand in hand. I truly believe I need carbs for all my muscle gains and endurance. However, I tend to choose the wrong carbs. Pastries, donuts, bread, haha! One thing I do love though is chili and soup. 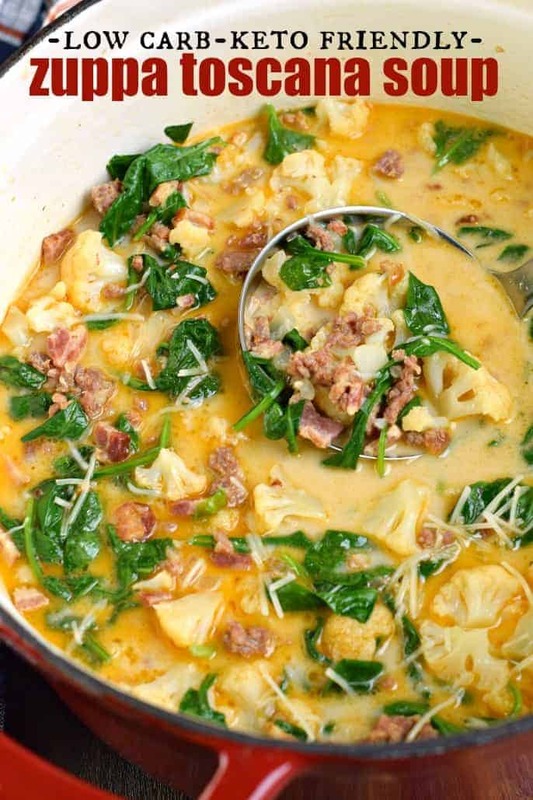 And you may remember this Olive Garden Copycat Zuppa Toscana Soup recipe from a few years back. It’s SO good. I had to figure out a way to make it CrossFit diet friendly. I mean, keto friendly. Ha, I mean waist management friendly. You know what I mean! 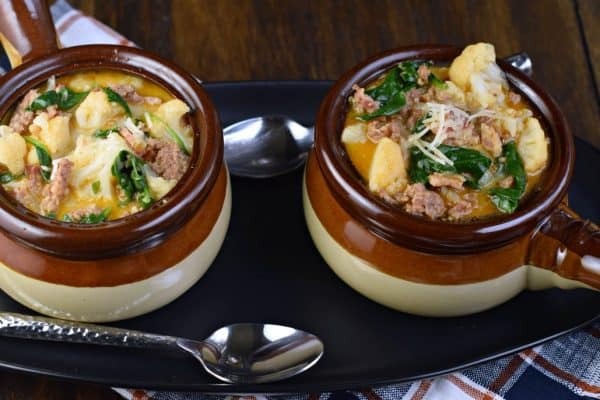 Here’s how I made an indulgent comfort food, like Zuppa Toscana Soup into a keto friendly dinner. First, keto stands for ketogenic. A ketogenic diet is a low carb, high fat diet. You may be familiar with Atkins, it has many similarities. The goal of a ketogenic diet is to drastically reduce your carbohydrate (carb) intake and instead consume fats. By reducing your carbs it puts your body into a state of ketosis. Basically, your body becomes quite efficient at burning fat for energy. Which is why many Crossfitters and athletes go on this diet. It also has other great health benefits, that you can read about somewhere besides this little food blog, haha! First, the obvious. Wheat-based grains or starches. Like rice, pasta, cereal. Potatoes and other root vegetables. No sweet potatoes, carrots, parsnips, etc. Stay away from sugary foods, most condiments and sauces as they tend to have sugar and unhealthy fats. Proteins such as fish, beef, chicken, eggs are all good to eat. Vegetables that grow above ground like broccoli and cauliflower are acceptable! Also, leafy greens like spinach and kale (which is great for today’s low carb keto soup recipe)! Avocado, nuts, and seeds are also good choices and make great snack options. High fat dairy. Praise God at least there is something good about a keto diet, haha. Hard cheeses, high fat cream, and butter get the thumbs up! Stevia is an acceptable keto-friendly sweetener. 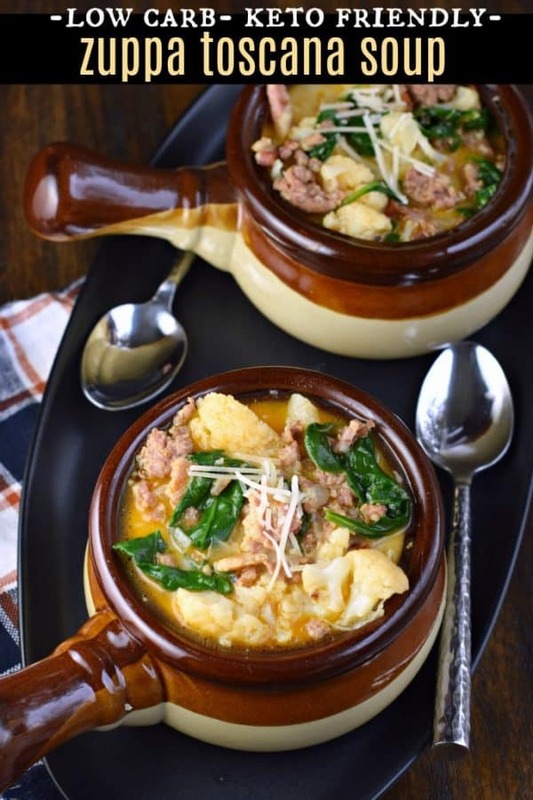 Unlike a traditional zuppa toscana soup, you’ll want to replace some of those high carb ingredients in today’s recipe. Start by swapping out the potatoes by using cauliflower. Yes, you’ll know it’s not a potato when you eat it. 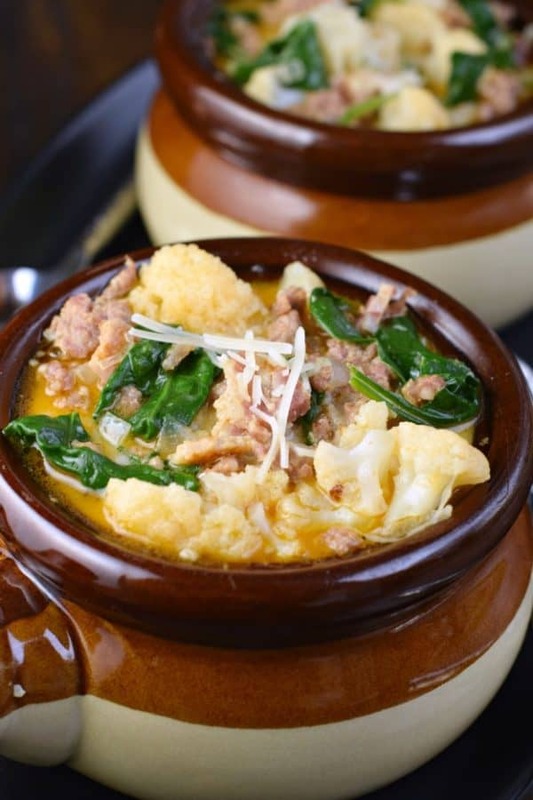 But, zuppa toscana soup is packed with flavor, and the cauliflower absorbs some of that flavor while also providing a great substitute for potatoes. 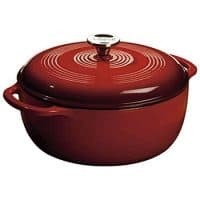 Using a large soup pot (like this dutch oven), brown your sausage and bacon together. I chose a mild Italian sausage (without the casings) and a thick sliced bacon. I chopped the bacon BEFORE cooking it to help speed up the process of cooking, and making it easy to assemble and eat. Add in beef bone broth (or beef stock or beef broth) to your cooked sausage and bacon. Why bone broth? I choose bone broth because it contains collagen which is GREAT for my joints (remember: CrossFit). It sounds gross, but it essentially tastes the same as beef stock or regular beef broth. You could also use chicken broth, chicken stock, or chicken bone broth instead of the beef flavor. Or vegetable broth for that matter. I found that the beef broth has the richest flavor for today’s soup! Next, add onions, garlic, and cauliflower. For the cauliflower, try to remove as much of the stem as possible, for best flavor. I used one whole head of organic cauliflower. Cover your dutch oven and cook for about 15 minutes, until the cauliflower is tender. Add in heavy cream and spinach. Yes, the true Olive Garden Zuppa Toscana Soup recipe contains kale. But you guys, I just don’t like the flavor of kale. If you love it, use it. I chose spinach instead because my family LOVES this veggie! 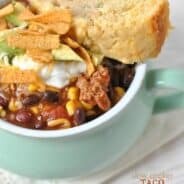 Q: Can I make this recipe in the slow cooker or instant pot? A: Well, given that today’s recipe only takes 30 minutes to cook, why mess with a good thing. If you try it in the crockpot or pressure cooker, send me message or leave me comment so the other readers know! Q: Can I freeze the extra soup? A: Yes! Freeze in ziploc freezer bags or airtight freezer safe containers. Thaw in refrigerator overnight, and heat in microwave or saucepan until desired temperature. 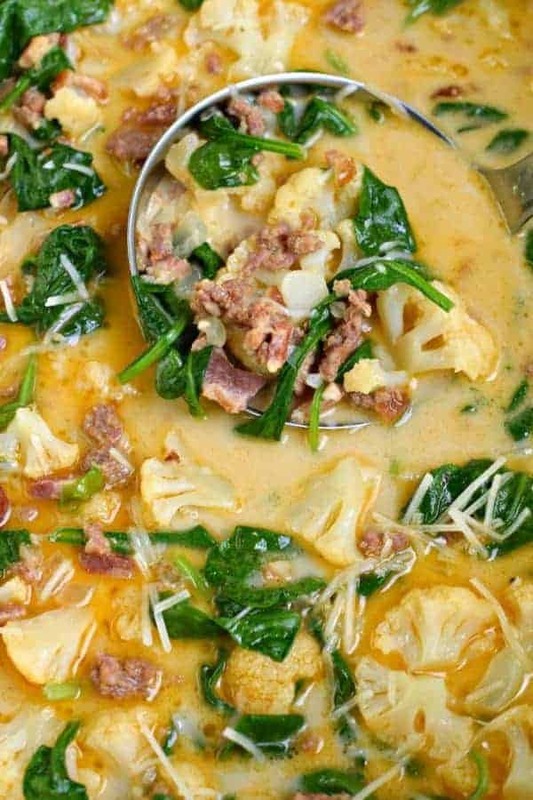 Q: What do I serve with keto friendly zuppa toscana soup? A: These Keto Everything Bagels are perfect for dunking in your soup if you’re missing bread! 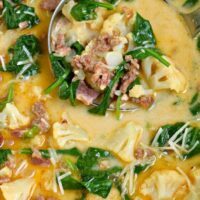 If you love today’s Low Carb Zuppa Toscana Soup, I’ve got a few more recipes I think you’ll enjoy! 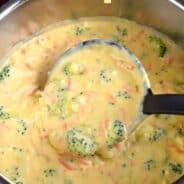 Creamy Keto Tuscan Soup recipe is one of my new favorite soups. Skip the cauliflower and add in some roasted red peppers for a dish of this comfort food! The best keto paleo chicken noodle soup! 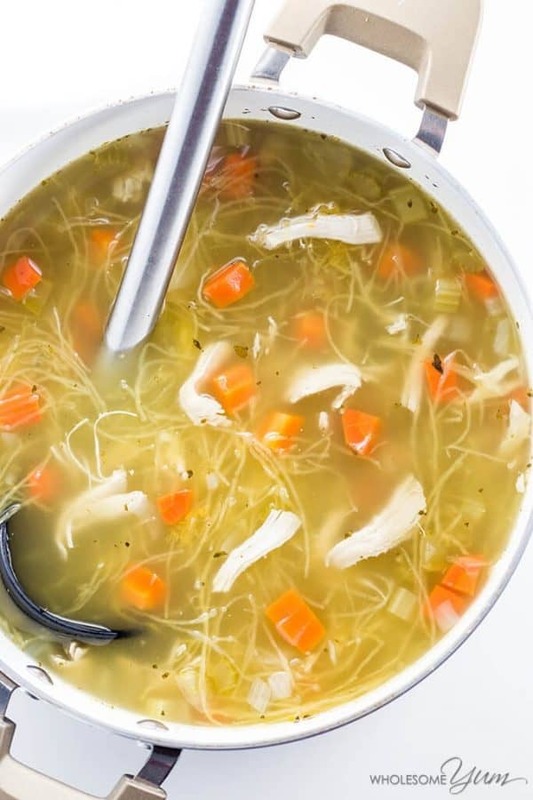 This low carb chicken soup recipe is super easy with just 8 ingredients and 10 minutes prep time. Using a large soup pot (like this dutch oven), brown your sausage and bacon together. Cut your bacon into bite sized pieces to make it easier to cook. Once your meat is cooked, add in beef bone broth, onions, garlic, and cauliflower. Cover and cook on medium heat for about 15 minutes, until the cauliflower is tender. Once the cauliflower is softened, add in heavy cream and spinach (or kale). Cook for about 5 minutes, until spinach (or kale) is soft. Serve with a spinkle of parmesan cheese and a pinch of salt, pepper, and/or crushed red pepper flakes. ENJOY! I’m all about anything Keto these days! I can’t wait to make this soup! I love this version of a classic such a great idea, when you’re watching your carb intake! I definitely want to make this this week. This looks so yummy! 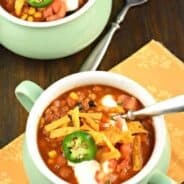 This soup is one of my favorites!! Making it this week for sure! Zuppa Toscana is my favorite! Love this recipe! I love this keto version of the classic! Yay for cauliflower in place of potatoes! Delicious! I LOVE the cauliflower in this soup!!! Today is such a gloomy day. This soup is exactly what I need! I love your creativity and I know it is only one meal, but please be careful when cutting out carbs. 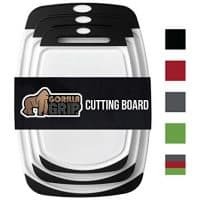 If you cut out too many, it can severely backfire in the immediate effects and have even worse consequences if done long-term. I love all of your recipes, and good for you for finding an exercise class you enjoy, but if I may say, I don’t think having a “diet competition” is all that healthy. There is enough of that restrictive/unhealthy diet culture in society. You are more than wonderful just as you are. Good for you, Aimee, by listening to your body and doing what is best for you and finding a balance that provides you energy to get through what sounds like an intense exercise program. I should try not to spout off nutritional/exercise advice myself; please do not take my comments as a critique of what is working for you. My best to you and your family. 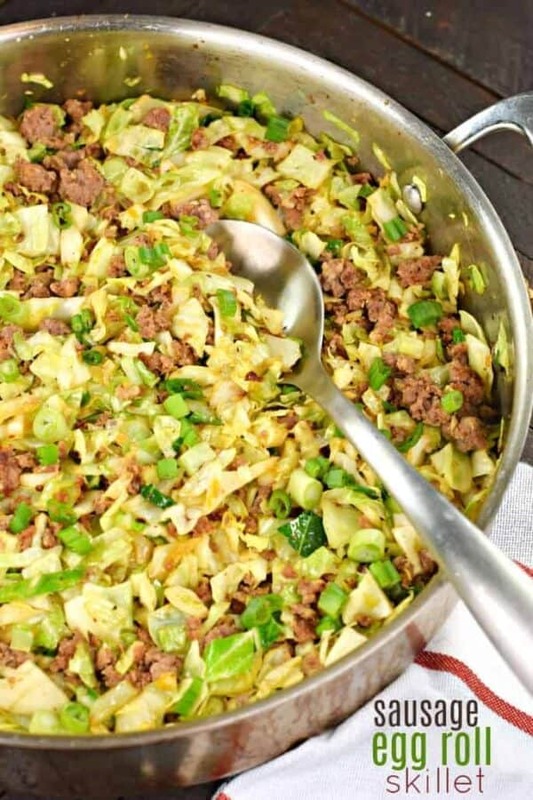 I know this is one of the most asked questions with keto recipes, but how did you get such a low carb count on this? If I use the carb manager app or calculate it myself, the count comes out to be anywhere from 10-13 Net carbs per serving. I use MyFitnessPal to calculate the carbs. I think it definitely varies by brand and exact amounts. I weighed my cauliflower and calculated that way, whereas if you’re using more or less it could really throw things off. AND…you’re right, LOL. I just double checked my numbers, and it’s 12 per serving…I missed the one in typing. Thanks for catching it! 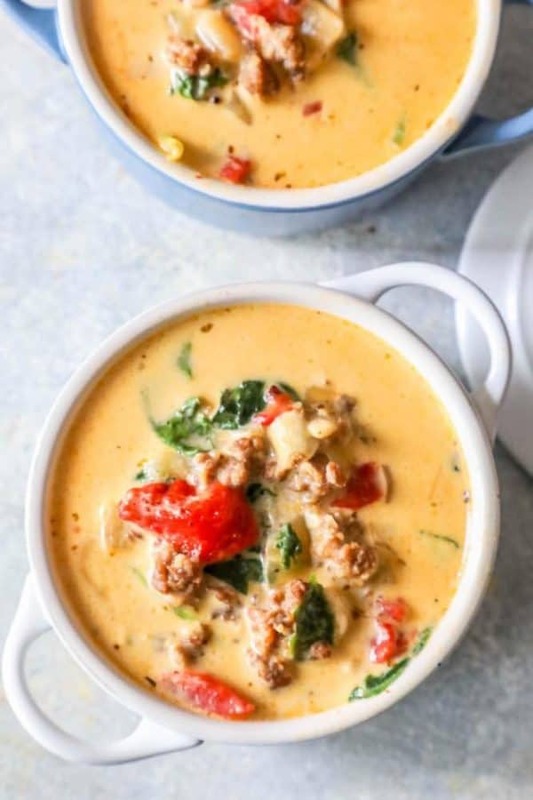 Pingback: Keto-Friendly Soups to Keep You Warm All Winter Long | Ridiculously Pretty! Tonight I made this soup with chicken broth. Wow I can’t belive how good this is! Thanks for posting. I just made this in my instant pot because I was using my stove to make fried chicken for my husband 😂. Used 1/2 chicken breast and 1/2 # sausage. Cooked 5 minutes (will try 2 min. ) next time after sautéing. Added kale when pressure dropped and let it cook in the hot broth while I finished his meal. Also used chicken broth because that was what I had on hand. Definitely a keeper. Thanks for the recipe. Can you tell what is the fats per serving? Can you please provide the fats per serving for this recipe? That would be greatly appreciated! I made this for the second time today and really like this soup. I doubled the recipe and used a full 1 lb package of bacon because I didn’t know what to do with the other 6 slices and bacon is delicious. For the first time I also made homemade chicken stock. I put all the skin and bones from a 10 lb package of chicken thighs in my instant pot with a large onion, head of garlic, carrot, 2 in piece of ginger, thyme, salt, peper and 3 qts water and pressure cooked for 40 minutes with manual release. Once cool, strain out solids and seperate the fat. It turned out incredible, easily one of the top 3 soups I’ve ever had. Thank you very much for a good recipe, I will cook it for the whole family for dinner. Thank you, it looks delicious!